As if wishful homebuyers didn’t already know this, real estate database Realtor.com has announced the 10 U.S. cities with the biggest housing shortages and Eugene and Portland made the cut. Data collected over the past 28 months shows that the housing market has high demand and low inventory of homes for sale in many parts of the nation. Buyers are jumping on listings within seconds of initial postings. Wanna-be homeowners are burrowing themselves into ever-scarcer, ever-busier open houses and going a little mad trying to get in the first bid. Real estate agents are knocking on hundreds of doors just to squeeze out one more listing. The biggest losers in a tight, depleted market are first-time buyers with limited budgets, according to a Realtor.com news release. The company measured the number of homes for sale in each of the nation’s 150 biggest markets and compared it to the total housing stock. Researchers also found the percentage decrease in for-sale homes from 2015 to 2016 to see if the situation is getting even worse. 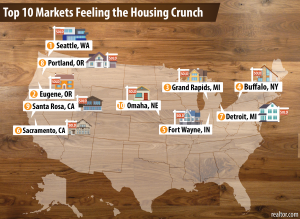 Data also showed that relatively affordable markets quickly run into inventory problems as they heat up while other former hot markets like San Francisco have cooled due to an inflated market. Impacts: Only one in every 263 homes in Seattle is for sale. Around 65 percent of Seattle’s land is zoned only for single-family homes, limiting high-density apartment buildings and foreign investors are holding on to property with no immediate plans to inhabit it. The Ducks hometown has its strongest housing market since 2006 and low inventory has homes selling within 24 to 72 hours, says Karen Church of Re/Max, who predicts some relief from an increase of ready sellers. Workers are being hired by data warehouse company Switch and the city has net in-migration for the first time in a decade. The city’s large population of 45- to 64-year-olds, mean fewer homeowners willing to sell. Prices jumped 14 percent last year as the unemployment rate dropped to 3.6 percent with robust advanced manufacturing jobs in aerospace, auto and medical devices. New construction hasn’t kept pace, leading the number of homes on the market to drop 24.9 percent. Housing prices spiked last year and downtown neighborhoods saw the sale of $300,000 condos and a rare $1 million loft. From 2015 to 2016, for-sale homes dropped by 25.7 percent. Homeowners in neighborhoods where home values have yet to recover can’t afford to sell. California and other transplants moving to here means the housing crunch gets more intense. Skyrocketing rents, including for pricey microapartments, create a sense of urgency among buyers. Developers are replacing modest dwellings with bigger homes or multifamily rental units, creating even fewer homes for entry-level home buyers. The city in Sonoma wine country is a modest alternative in pricey Northern California, which results in three to five offers, says Realtor Kimberly Sethavanish of Kimberly James Real Estate. With affordable homes and promising job opportunities from Omaha’s “fab five” Fortune 500 companies, including Berkshire Hathaway and ConAgra Foods, the city is overwhelmed with homebuyers eager to make a move.